Ivan Foster is a recently retired minister in the Free Presbyterian Church of Ulster. Until November 2009 he was minister of Kilskeery Free Presbyterian Church. He continues to preach and write as the Lord gives opportunity. Ivan has written 485 articles so far, you can find them below. The Lost Sheep, # 10. 1.We have the merciful patience of the Lord toward the rebellious wicked displayed. We would have been totally out of patience with these Pharisees and scribes long before for they have continually been hounding and contradicting theLord and seeking to fault his words and actions. It ended with their conspiracy to kill Him. Matthew 12:14. This is where Christ-rejection ends. 2. He explains the central purpose of His coming. Save lost sinners. “For the Son of man is come to seek and to save that which was lost,” Luke 19:10. Not, as the Pharisees and scribes believed, the glorification and exaltation of the nation of Israel and the establishing of Messiah’s earthly kingdom. This was a common expectation amongst the Jewish people back then. Even the disciples are looking for that time of blessing. “When they therefore were come together, they asked of him, saying, Lord, wilt thou at this time restore again the kingdom to Israel?” Acts 1:6. Even after Calvary this idea was still in their head! They were, however, to learn that before that day of Israel’s earthly glory there would be the gospel age when all nations would hear the message of salvation. 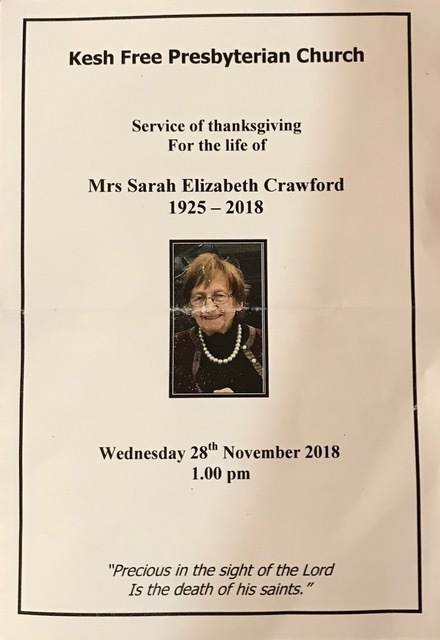 Stream or download Mrs Crawford’s funeral – Church and graveside. Tribute and graveside message by Rev Ivan Foster, long time friend. The first two verses of this book present us with the initial setting for the history it contains. The small book of Ruth nestles between the book of Judges and the 1st Book of Samuel. It provides the perfect link between the two eras. It is like the first streaks of dawn that heralds a new day. The opening reminds us of the dark days of the judges but the book ends with the birth of David’s grandfather, and the hope of brighter times that generates. It is a book in which is foreshadowed the future ingathering of the Gentiles and of better times for Israel when the Lord will visit them again. The last word of the book is David. It certainly points us to great David’s Great Son! It is the 8th book of the Bible and as such marks a new beginning. We all know that the whole of Scripture is relevant to our day, even as it has been for all previous generations. Some portions, however, are most obviously relevant. This book is particularly relevant to our day. The last verse of Judges: “In those days there was no king in Israel.” Judges 21:25. 1. There was no king. No central command or unifying government. The Lord should have been their King but His law was ignored or rejected by the nation generally. For many professing Christians today, there is “no king.” They are not governed by the law of Christ, the King. 2. Instead there was self rule. “ . . every man did that which was right in his own eyes.” Every man was his own king. His whims and fancies, his desires and ambitions were sovereign. “I think” replaced “Thus saith the Lord.” Doctrine is proclaimed on the basis of how popular it will be rather than whether it is in the Word of God or not. 3. It effected everyone. “ . . every man.” This was the universal rule within Israel. It helps us understand the tragedy that takes place in the opening verses. “And Elijah came unto all the people, and said, How long halt ye between two opinions? if the LORD be God, follow him: but if Baal, then follow him. And the people answered him not a word,” 1 Kings 18:21. The shifting ‘weathervane politicians’ emerge!! What he means by this ‘politispeak’ is, he does not want the Rep of Ireland to lose the political gains it made during the recent years of Unionist compromise and sniffling weakness!! In other words: ‘The damage is done’!!! And she will get it!!! Malice toward Ulster Protestantism has ever been central to Irish Roman Catholicism’s thinking!!! Brexit deal: The importance of being unionist? The cry of the ‘merchants’ – Revelation 18!!! Varadkar’s disparaging remarks regarding the ‘Union’ between NI and Great Britain clearly show that the present ‘Brexit’ deal is a threat to that Union. Men will learn that there are more important things than earthly riches !!! This is what the ‘ecumenical’ school system of ‘Integrated Education’ produces!! The DUP is far, far away from its founding moral principles and yet not a member will raise more than a mutter, if even that!!! The embryonic thinking of a future submission to Antichrist! ‘These (the ten kings) have one mind, and shall give their power and strength unto the beast,’ Revelation 17:13. The utter hypocrisy of Irish Roman Catholicism!!! Since most of the abuse took place in Roman Catholic institutions why is it not made to properly compensate the victims?? He is someone who REALLY believes in ‘pro-life’!!!! Remembering and honouring cowardly, murdering terrorists is important to Sinn Fein!! Let every Christian parent, who defies God’s Word and places their child under the ungodly system of state education, take note of this scandalously wicked development!! A story is circulating of a student who started telling his fellow students that he wished to be recognised as a woman and he was enthusiastically informed that would be fine, no problem! ‘But I want to be recognised as a 6ft 3in woman,’ he said! The response was given: ‘But you are not 6:3”! But I am not a woman either so where is the problem!!!?? ?